One of the most influential musicians on me. Wow, weird I was singing ELP at work today without even knowing. Ugh, another musical wonder sent to the stars. . .
One of my biggest influences. Sad. I have to admit, none of the announcements of recent musician deaths made me quite as sad as this. He was a true visionary and maestro. I had only recently begun buying vinyl again and ELP albums have been at the top of the list. Today, I lost part of my youth. Currently have Brain Salad Surgery on the turntable. One of the most influential for me as well. Tarkus is, in my view, one of the greatest compositions from that period. My three ELP favorites were/are Tarkus, Pictures at an Exhibition, and the first album. But Tarkus is just amazing. I saw them on tour, promoting BRAIN SALAD SURGERY, in IIRC 72 or '73. 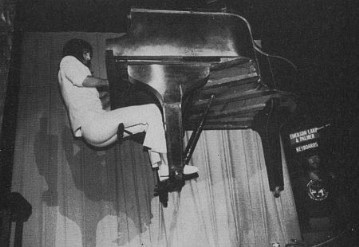 All the stage gags, with Palmer's huge, engraved metal drum kit rotating and levitating, and the amazing gag where the Steinway levitated above the stage and then started rolling end-over-end while he's still playing. Never knew if that was real (I doubt, no wireless in those days) or if it was to a tape, but a stunning visual nonetheless. Carl was in great voice, and it was the first time I'd seen an Alembic, he trotted out that 8-string for several things. As well as a lovely Zemaitis box with the heart-shaped soundhole. 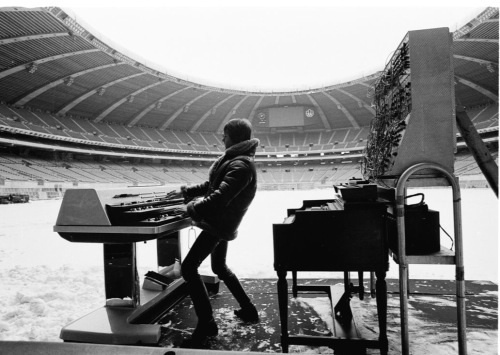 He was such a matador, standing, playing two keyboards with opposite hands while staring the audience down. 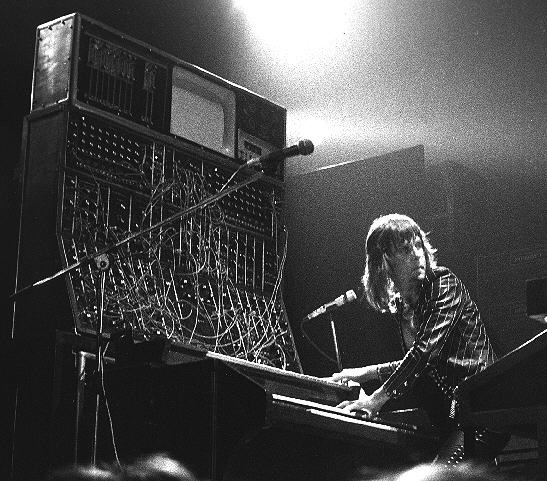 Never knew HOW he could tour with that Moog, what a beast to keep running, much less in tune. But what a player ! Like Jon Lord in a way, they just attacked it. A lot of the show was the usual-for-its-day prog-rock bombast ( . . . . it was the 70's, you know), but they performed KARN EVIL 9 in its entirety, and the middle movement is essentially a jazz trio piece, and it was worth the price of admission: All beef, no sides. If you've heard the follow-on WELCOME BACK MY FRIENDS live set, that's essentially the show I saw, Quad PA and all. I was at the Wembley tour of Brain Salad Surgery but my claim to fame is that I am in the crowd when they recorded Pictures at an Exhibition at Newcastle UK. Excessive in all respects with their three massive trucks, the modular Moog, the three ton drum kit and Carls' Persian carpet,heady days competing with Yes, Barclay James Harvest, Genesis et al. "I have to admit, none of the announcements of recent musician deaths made me quite as sad as this." Jonathan, I agree completely. I know we all have to go sometime, but this is a shock. 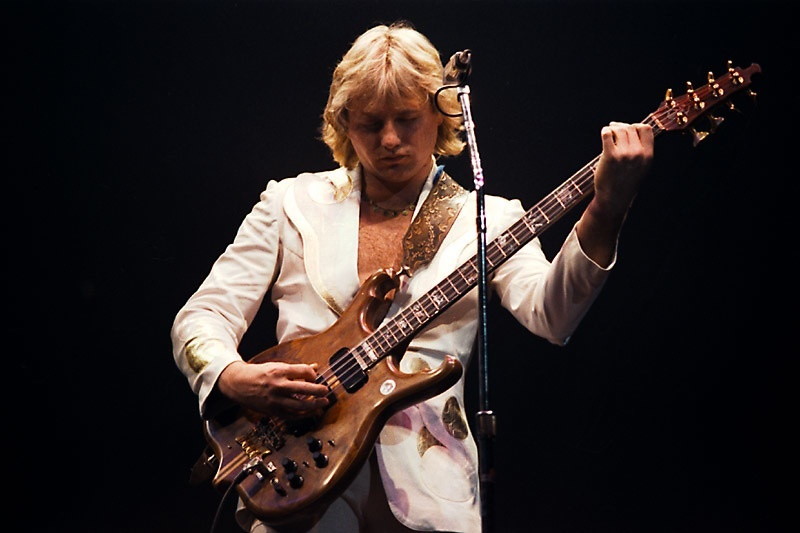 ELP has always been a huge influence for me. It was. Keith tells the story of how it came about on his Wikipedia page. I was 17 when Brain Salad Surgery slammed it's way into my rather thick skull, in Dave Swonger's room, after school. I remember the moment. To this day, listening to it just isn't the same without Dave's dad banging on the door and yelling; "TURN IT DOWN!" 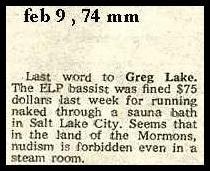 I think ELP would have appreciated that, since it seemed to be what they were aiming for. See? Nothing! To have been one of the most spectacular showmen ever born, with the rarified musical genius so few are granted ... And a nice guy. Bad rock star. No biscuit. I mean, Bowie joining Major Tom just about dropped me to my knees. This is a different kind of sadness for some reason, that reaches a place in my core. I think I may have honed in on its source. I read Eric Idle's account of a conversation with George Harrison. Eric was complaining about people constantly asking when Monty Python would reunite. It had become the bane of his existence. Nobody on earth was asked that question more than an ex-Beatle, but George had asked his guru about it, and his response changed everything. From then on, George felt it was the highest form of compliment one could offer, or receive, because it came from the most cherished innocence of our souls. George said; "when they ask me when the Beatles will reunite, what they're actually saying is; 'can you make us young again?' The answer is; 'of course. Just put one of our albums on.'" The working title of "Brain Salad Surgery" was "Get Me A Ladder." I love that. This is the Moog Constellation module in Toronto (nothing plugged in, Keith as poseur. Doing a bang- up job of it, though.) The top module ("Apollo") originally had a Tektronix Oscilloscope mounted in it - as a joke. You can tell the succession of rigs by how big the monitor became over time. 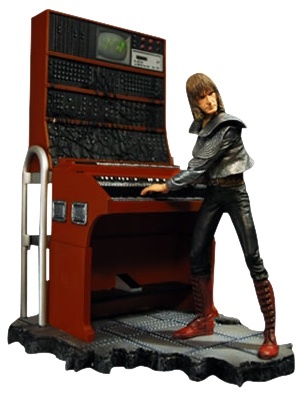 It's even part of the Knucklebonz Keith Emerson statue. My brother Pete did his thesis on Tarkus. He needed and received Keith's permission to do it, and was able to interface a bit with him during the process. And then, in the world of small worlds, Travis Davis, the bassist in the Keith Emerson Band, is a friend from way back. Still having a hard time processing the talent we've lost this past year. John, that is truly cool that your brother did that. Keith was so very proficient at tickling the ivory's and stabbing them. His ability to seamlessly incorporate so many different genres makes him legendary.